On November 27th, one day away from my Birthday (note the capital ‘B’) I found myself in Binyamina, Israel, staying with family . That’s always the best. I didn’t rent a car, so on the mornings I wasn’t at Ramat Hanadiv or in the Wadi David at Ein Gedi, I was hiking the agricultural fields. Sometimes I asked the Above for success in my search for the butterflies of the mysterious Middle East. I was in Israel to celebrate the birth of a grandson. Seeing new butterflies in late November was a challenge, and it was the second on my list. Well, it worked. After photographing Large Salmon Arabs, Small Whites, Clouded Yellows and that yummy! Lesser Fiery Copper, I was ecstatic. My trip to Ein Gedi, to find the exotic Blue-Spotted Arabs was ahead of me. Good. But more fun was awaiting me. Wait a second! What was this tiny fellow that just alighted onto those Camphor yellow blooms? OK! Something new. New! Shooting slide film has certain disadvantages. After scoring several exposures of this fellow, it did its fighter jet flight. Whissst! Gone! My old NYC cop friends were able to recall critical features of someone with whom they had an encounter with. I’m not sure that I’ve developed that with butterflies. So after concentrating on getting the images, lighting, manual settings, I could barely recall the identification highlights of this guy. Comes back the slide and here we have a Deudorix Livia. Smile! Common along the southern Israeli-Jordanian border and the eastern and western shores of the Sinai peninsula. It is much less common in most of Israel. Very good! This male sports his intact tails and prominent black hindwing spots. A bit of wing damage reveals the hot burnt copper coloration of upper wing surface. It’s a Hairstreak. This photograph was among the many successes of that trip. It is consistent with my oft written explanation of Why I continue to enjoy what I do. You can never be sure. Could this encounter be a birthday gift? Pretty nice Birthday gift if you ask me. Nice photo. Pretty little fellow. 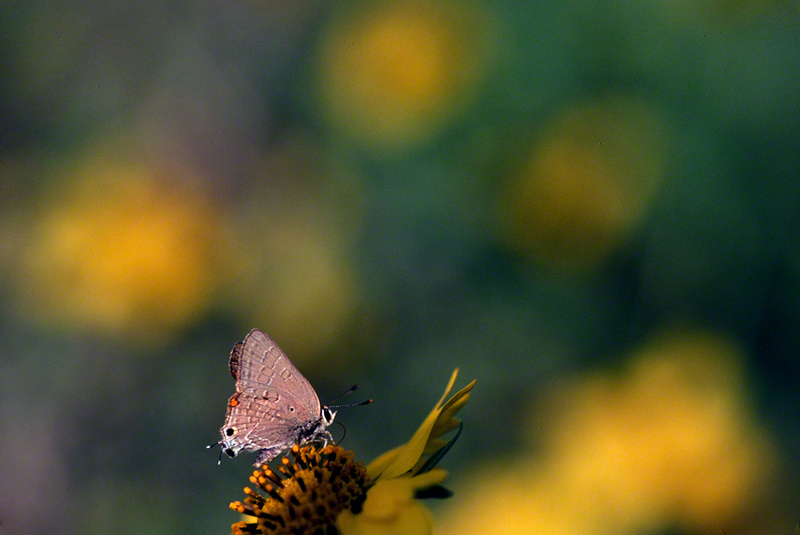 I have taken many pictures of Hairstreaks, mostly gray, red-banded ones. They are so small that they are easy to miss. I love the way they constantly move their wings together and feed with heads down. I understand that the action of the wings is supposed to divert possible predators away from their heads. Keep up the good work, Jeff.